I get a lot of inquiries about the antique white paint I used on many of the walls, trim and my white kitchen cabinets in my old house. I absolutely love this paint color, especially for an old house. It is so subtly creamy, soft and delicious. If you don’t want a stark cold white, but not a beige cream color either, I love this shade. It looks beautiful with soft yellows. The subway tile I used in the kitchen is a really beautiful butter yellow (Pratt & Larson) and it is a lovely complement to the antique white paint. This picture doesn’t show the contrast very well between the tile and the cabinets, but the tile is more yellowy. Of course, every paint color will look different depending on your own lighting, so always get samples first. I started out covering almost every surface in my house with Sherwin Williams Antique White. My house just needed to start with a clean blank slate! Kitchen cabinets take a lot of abuse, so as long as I was having a professional paint my kitchen I wanted to make sure the paint was going to hold up and I decided to have my paint mixed by Benjamin Moore for the cabinets. Several years later, the Benjamin Moore paint still looks great. Just to keep the trim color consistent and therefore easy to know what to buy for future paint purchases no matter what room needed a touch up, I used the Sherwin Williams sample and had it custom mixed at Benjamin Moore. That way I don’t have to remember which formula went where. The trim is all the same throughout the house. I think this paint color was the perfect choice for my old house. Pure white just would have looked too new for this house, the fabrics and upholstery I had — this shade has a hint of yellow so it gives it a real authentic old world look. For these cabinets, my painter used an oil based semi-gloss paint and they look beautiful! Do not expect all paint called Antique White to look the same. Benjamin Moore Antique White is not at all the same as Sherwin Williams Antique White. And, paint stores can change their Antique White formulas over time so do not expect a new formula to look the same as an old formula. The only way to get the same paint formula I used is to insist on a paint store using the formula I provided. With that said, you need to always test paint first in your own house. Lighting in your home, in your part of the country, can be entirely different and paint will not necessarily look the same as what someone else experiences. Always test paint first and observe it in all lighting at various times of the day, before painting your cabinets or room, to make sure it will work for you. I found another favorite white paint that I am using in my new house, White Dove! It too is a nice soft white but is more white than in my previous kitchen. Come see how it looks in the new kitchen reveal post! 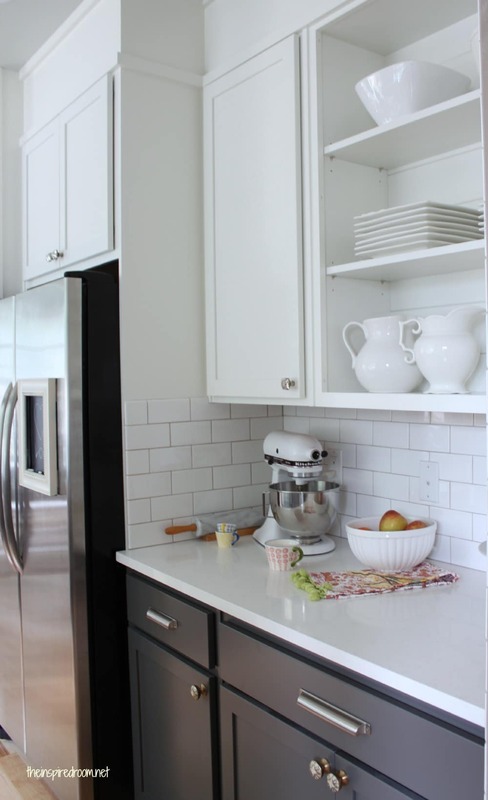 You might want to check out these posts featuring white kitchens for more inspiration! You may also enjoy checking out photos of my new house! love antique white. my parents used a Benjamin Moore antique white but I am not sure what the official color is called for their kitchen cabinets and trim and some of the walls in their cottages. I am resisting the urge to paint my whole house in antique white now. It’s so soothing. Thanks for posting this. A great white is so hard to choose so this is really helpful! Melissa – Do you have this wooden counter top throughout your kitchen? I was thinking of a wooden counter top but my husband is afraid that it will get stained and moldy around the sink. Yes, I have the wood around my sink too. The wood area around my sink looks PERFECT. No mold, no wear and tear, no warping. That was the area I was wondering about too but NO PROBLEM! I just keep it dry and it has a really good coat of sealer stuff on it so it is well protected. The whole counter is in awesome shape. Even if you get a little scratch it buffs right out and is back to perfect again. I don’t mind a little scratch as it shows we live there, but when you go to reseal it every few years it goes back to perfect again. And resealing it is EASY too. I’ll do a post on it sometime. Just curious what was the sealer you used? Cool! Thx so much for the “secret formula” and “best brand”,saves all of us A LOT of trouble!!! I would never have guessed that tile for yellow! I agree that most of the time white-white is simply too bright. I opt for the slightly creamy color. do you use oil base for cabinets and trim? Yes, oil. Makes a huge difference for cabinetry and trim! What finish of oil paint did you use–eggshell, glossy, semi-gloss? I certainly understand where you are coming from. Finding the perfect white can be so hard. Last time I had about 10 paint swatches taped to the bedroom wall trying to make up my mind. My son came in and said,”Mom. they are all white.” Boys! The light in your house really does make such a difference too. Ended up with Behr’s powdered snow…just a touch of powder…not too yellow…not too gray. Melissa…hope you are feeling better. Thanks for this Melissa…I’m looking for a new look in our room. No more LA Gold 3…going for lighter brighter. Catching up after my little bloggy break. Hope you are doing well!! LOVE it! I’m so glad you wrote this post. I am one of those people who just buys paint at Home Depot, but I’m getting ready to paint my son’s room and then our master bedroom later. I’m definitely going to buy quality paint for those applications if it really does make that big if a difference in the way it holds up to abuse. What a great post with excellent advice Melissa…AND I so appreciate your response to the comment question about oil or water…You (as always) are right on. 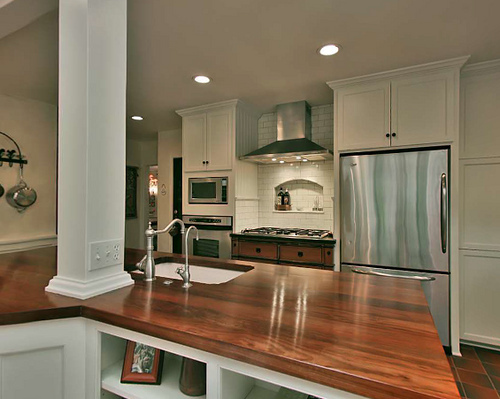 We used Dunn and Edwards Swiss Coffee – for all our cabinetry in the kitchen and trim. Unfortunately, my designer that was helping me at the time said USE OIL BASE….the contractor (not licensed or bonded- BIG MISTAKE) convinced me at the last minute – by telling me that his boss said water base would be just fine…. In our rental – we used Sherwin Williams – White Linen. Now as to my comment….I’ve not been happy with the Dunn Edwards (partly because I didn’t listen and went with something I shouldn’t have)…and it’s nice to know that you found a good paint in SW.
Thanks…and keep up the good stuff here! Hope you get to feeling better soon! Thanks for the post. I used a water based paint on my white kitchen cabinets, and I will need to repaint soon (after only 4 1/2 years.) Next time I will use oil for sure! I’ve been wondering about changing the color from my current white to something a little softer, maybe antique white, now that you mention it! However, I don’t know how that would look with my pure white subway tiles. I also would not want to change all the white trim in my house. Do the cabinets have to match the trim around the windows and floorboards in your opinion? How did your paint look with pure whites? Thanks! Love your blog! I personally don’t mind mixing a few shades of white in a home. I think you can pull it off as long as it is evident that you are mixing whites and not just making a one time mistake. In other words, don’t just have cream cabinets and white trim. Have lots of shades of white plates on the walls and various shades of white fabric too. In one of my last kitchens and bathrooms I intentionally used white and cream tiles in order to not be stuck one way or another. As a side note, you can paint tile. As long as it is properly prepared and especially if it is just on the walls. I have done that before successfully. That aside, I have some pure white things like my kitchen sink and I never notice that it is different. I actually have several different whites on walls/trim in the house because I didn’t repaint absolutely every surface. Every time we did paint with white though, we chose the same shade to simplify things. A couple of the rooms had already been painted a soft white before we moved in so we just left those as they were. I am all about saving time and money and if it was just done, I rarely redo something unless I hate it. I think it really depends on the room, the surfaces and the lighting whether you’d be bothered by a whiter window trim/baseboards mixed with creamy cabinetry. It might bug you a lot but it might look just fine. I think some houses just seem to be able to handle variations. Maybe older houses are more forgiving since they are old and you expect some variations as colors fade over time! I love the look of all different shades of white plates on my walls so I know you can pull it off if you mix things up enough! Thanks for the tips on the soft white paint. You are so right–it is very difficult to find a good white paint color. We have painted white cabinets for 29 years and oil-based paint is the only way to go. Sure keeps them looking pristine for years! Hope you are feeling better and getting stronger every day! You are in my thoughts and prayers. Hope you can swing by Rose Cottage to follow me along my millinery masterclass travels to southwest France. Chateau Dumas has been such a good rest for my soul. My very best to you! Is your paint mixture for a gallon or quart? I know last time I took in a custom mix, they needed to know what size they were dealing with. Oh, hmmm, interesting, well this particular can is a gallon size. I hope that helps! I have bought this paint in all sizes and I didn’t know it mattered with the formula. But if so, this can is definitely a gallon! I didn’t realize that it mattered either. I went into Home Depot and asked for a quart of a color I found on another blog. I had taken a picture of the lid so I knew the tint colors/amounts. Afterwards the guy questioned me about the size can. (I must have wanted a lot of tint added to my quart or something–whatever it was it was enough to raise an eyebrow!) Luckily, we could still read on the lid that the custom color amounts were for that of a gallon size, so they altered it accordingly. I guess it makes sense. I used the Behr by Home Depot version of “antique white” in a large part of my house. In the north facing rooms with lots of light, the color looks fine… a basic, clean, slightly warm white… just what I was looking for. In another room with only east facing windows and very limited natural light, the color was very cold. It looked like primered, unpainted, greyish newly built walls BEFORE they’ve been painted. So I repainted using Behr’s “cottage white” and I love it. Warm, creamy and a much more welcoming background… it looks good at all times of the day and you don’t notice that the adjoining rooms are two different whites. Whites are easy to get wrong… and make all the difference when they’re right! There are so many shades of white, it is worth taking the time to experiment and find the perfect tone for your own place. Melissa, What a pleasant surprise to see the label for your paint store. 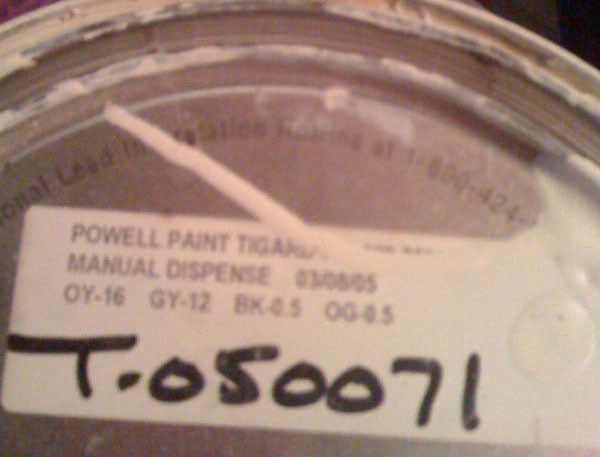 I have been using the Tigard Paint store for over 20 years. Thanks for the “recipe” for your paint. Your old kitchen is absolutely amazing! Stunning! I’m having serious doubts whether or not I should paint my kitchen cabinets. They’re unstained maple & they’re only six years old. However, some of them are looking rather yellow. I love the look of a clean white kitchen but I’m really concerned that if I paint my own cabinets they won’t look nice and it might hurt trying to sell my house. (the only painted kitchens I’ve seen locally are the ones with old, rundown cabinets). How do you decide between what you want and what would make sense financially? Hmmm, good question. Are you selling your house now, for sure? Or just thinking about the future? My feeling is if you are not planning to sell for sure any time soon, do what you love. I think natural wood cabinets can be warm and pretty, so I wouldn’t rush to paint them unless that is what you really want. And if you do want that look of white painted cabinets and think you will be selling the house, it would pay off to do a reasonably good paint job. Otherwise, if the cabinets are in good shape, I’d leave them like they are and just freshen up the rest of the room if you want a little update! I recently painted the inserts of beadboard on my cabinet doors blue, but I’m thinking they really should have stayed white. I’m gonna repaint when I get home, because yours looks soooo much better and maybe I will be more appreciative of them now that I’ve seen someone else do it, too! Glad to see the subject of oil vs. water based paints discussed. While oil may be the best finish overall, water based paints have come along ways. For the do-it-yourselfer water based paints are much easier to work with. Also, if you are considering enviromental impact, water based paints are hands down the way to go. Just wanted to throw in my 2 cents. Thanks!!! This is the look of my dream kitchen! I realize i’m a bit late on this post but I was really interested in your counter top. I’ve been looking for a butcher block that didn’t seem too engineered and yours is beautiful! If you don’t mind my asking, what kind is it, where did you get it, what sort of stain etc? Just lovely! I just bought a house that used SW antique white as the trim color throughout the house. It looks closer to white in most rooms except my daughter’s room, and it looks much more of the tanish color. They painted the walls bubble gum pink and I’m wondering if it’s playing off of the pink color? I don’t like the pink and I’m trying to find a good color to repaint the room. The ceiling has a beautiful mural of a blue sky with clouds that will stay. I was thinking of a soft yellow or creme and was happy to see that you thought it went well with Antique White because I was thinking I might need to repaint the trim, which I would rather not do! What color do you suggest? I really appreciate the advice! I love this shot of your kitchen!!! LOVE. 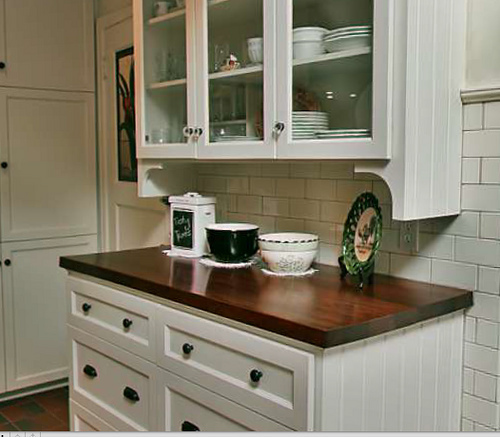 The wooden countertops and glass knobs and subway tile and sort of white washed feel… LOVE. My kitchens usually have sharper lines and are a bit more modern, http://tearinguphouses.blogspot.com/2009/10/before-after-pictures-pad-by-sea.html, which has made sense living in South Florida. However, we just purchased a historic 1929 brick home in North Florida, and I’ve really been stumped for kitchen inspiration that’s both interesting but also architecturally appropriate. Well, I just found it. .-= Kelly@TearingUpHouses´s last blog ..Ninth Bag Of Mail =-. What finish do you use ? I have some mahogany chairs and a table I’d like to do white ….still recommend oil for them ?? I ‘m still not sure though what finish you are recommending for the cabinets…is it eggshell, satin or semi’gloss or what? is it the same whether using water or oil based? Can you please help! I took this code to Sherwin Williams today and they said they couldn’t fulfill that code…that it wasn’t theirs. Do you know what your original Sherwin Williams code was?? .-= Aimee´s last blog ..Why I Don’t Like Couponing =-. Right, it is not Sherwin Williams. It is Benjamin Moore’s code. I don’t know the original Sherwin Williams one. SOrry! Help, help, help! I am not very talented in decorating and especially in paint color. I have my painter brother painting all my ugly kitchen cabinets while we are on vacation next week. I have to know in three days what color to make them. I am thinking about this Antique White color. We will be using Benjamin Moore oil-based paint for the cabinets. I have a medium color wood laminate flooring that will not be changed. We will be changing the countertops; was leaning toward tile, stone-look 12″ squares (but am open to other ideas). But MOST IMPORTANTLY, I will likely NEVER change out the cabinets again in my lifetime from whatever I paint them. I do want to move toward more warm colors in the kitchen, but I want to have flexibility in the years to come. WHAT COLOR SHOULD I PAINT THE CABINETS? Whatever I do, I will have to live with and I am running out of time deciding and the pressure is about to drive me nuts. Thanks for any advice, I’m feeling desperate. Hi, Cindy. I don’t know where you live but my local Benjamin Moore paint store has a decorator on staff to help with color selection, curtains and drapes, etc. Customers bring in their fabric and flooring samples and the decorator helps select wall and cabinet colors. We painted our old, tired, 1970’s kitchen cabinets last year and my recommendation is to get a few samples and painting an entire door with each color. It looks a lot different on an entire door than a paint swatch! I too would love to know what finish you used (ie eggshell, semi gloss or gloss) as well as what method was used to paint the cabinets. Was it by hand (roller or brush) spray gun etc. My husband and I are “adjusting” our 1990’s kitchen update in our 1930’s townhouse on a budget. So much fun! This is so pretty. I am wondering if the subway tile is glossy or matte? Thanks for all the valuable advise and inspiration. I, too, am wondering about the finish on the paint… eggshell, satin, etc. thanks! Hi, Melissa. I’ve sure enjoyed reading your blog, especially this post. Have those almond colored appliances right now in kitchen and all the shades of white I’ve tried have not worked. Going to try out this formula as it is a touch darker than my cabinets. Hope this works out. This has been so hard! What color did you paint your trim?? Question….have you seen the SW paint sample for antique white lately? Very ivory to taupe. Could it be that the formula at SW has changed OR is the formulation you use indeed taupish ivory? The paint companies change their formulas all the time so whatever it is now may not be what it was back then. You should be able to take the featured formula to Benjamin Moore and have them make it just as I did…have them do a sample first to make sure you like it. It was not taupe at all, more creamy yellowy than brown. Good luck! What a great blog! I’m going to give your paint colour a try on our old farmhouse wainscotting, and am just wondering what finish you chose … satin, semi-gloss, etc? Thanks so much! I am getting my cabinets repainted and I love this shade! The woman who is painting them, however, said that water based is the way to go since oil based paints will soon be outlawed here. Any thoughts..? Also, DID YOUR PAINTER DO THESE ON SITE,OR DID YOU HAVE THEM SENT OUT? AND WE’RE THEY SPRAYED OR DID THEY USE A BRUSH OR ROLLER? I am kind of nervous that they will look “painted” if they are not sprayed. In my new house I’ve used a Benjamin Moore latex that is great, so you can go whichever way you feel best about. But these particular cabinets were oil based and sprayed! The doors were sent out to be painted and in some cases the contractor had a plastic tent he used outside to spray some pieces. Ok so you think latex and using a brush would give a similar look? And, most importantly,what is the actual NAME of the BM creamy white which was sprayed on your cabinets? That seems like it would be perfect for my cabinets. Or if custom, do you have the formula? I have all my trim in the house SW Dover White, and would like to do this color on cabinets to have a little contrast. I love mixing different whites and creams together. I love your taste….just beautiful!! I’m in dire need of the formula for the Benjamin Moore dove white!!! Please share. I’m trying to paint tomorrow! Thanks in advance. I took your formula to a local Benjamin Moore — OY 16 GY 12 BK 0.5 OG 0.5 — and was told they don’t use this type of formula anymore. Do you know how I can find the same “white paint for an old house” you recommended? Thank you. I have been hearing that and am not sure why they aren’t using the formula anymore! Sorry about that. In my new house, I’m using Dove White by Benjamin Moore. It is also a very pretty creamy white, probably whiter than the antique, but still lovely. I’ve also been looking at ‘Swan White’ in Glidden that seems to be a slightly creamier white, you could check that one out as well! What is the base and size of the can for the antique white paint? What is the base of the antique white paint that you give the code for? My local Benjamin Moore asked if it was pastel?